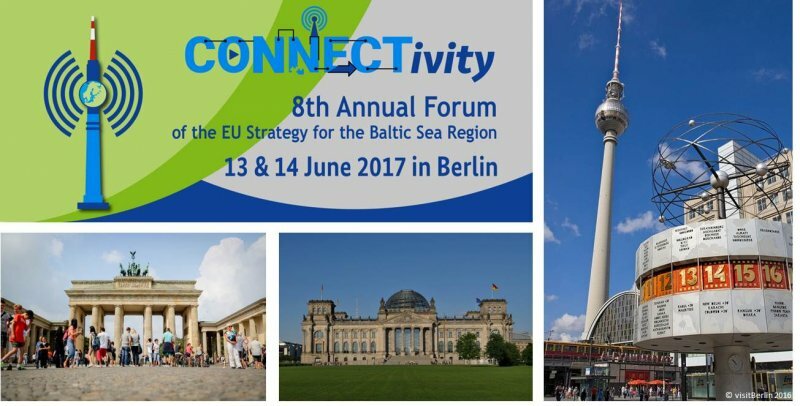 The 8th Annual Forum of the EUSBSR was hosted by the Federal Foreign Office together with the CPMR - Baltic Sea Commission and in close cooperation with the European Commission on 13 - 14 June 2017 in Berlin. About 800 participants from governments, international organisations, NGOs, universities, local and regional administrations and business discussed a broad range of issues relevant for the Baltic Sea Region. The theme of the 8th Annual Forum was connectivity. This motto highlighted the necessity to intensify contacts throughout the Baltic Sea Region including its neighboring regions and to develop a better awareness of each other’s perspectives. Cooperation in form of mutually beneficial projects may have beneficial spill-over effects and contribute to confidence-building in politically difficult times. Furthermore, connectivity relates to efficient and comprehensive collaboration among all levels of government. Be it in communication, cultural exchange, energy, research activities or transport - connectivity is crucial for modern, network based and outward looking business. Since 2010 a yearly forum has been organised to support the EUSBSR. The purpose of the forum is to communicate the work of the Strategy and its objectives, to stimulate policy discussion, promote results, and to provide stakeholders of the EUSBSR with a networking occasion. The annual forum takes place in one of the eight EU member states in the Baltic Sea Region and aims to attract key stakeholders and active partners of the EUSBSR from local, regional, national and EU level. The 19th BDF Summit was arranged in conjunction with the 8th Annual Forum of the EU Strategy for the Baltic Sea Region. This year, the 19th Baltic Development Forum Summit challenged old truths and took a look at how a changing world creates new perspectives on growth. In what ways can an increased focus on sustainability and social engagement provide profits for business? How can the digital transformation open up new opportunities for small and medium size companies around the region? What will the political and economic developments within and outside the region mean for regional cooperation and our future economic performance? Together we will chart a new way for how to grow our region.